Marc Bleron and Todd Hershiser gave me some very valuable feedback through their comments on my recent “Splitting Strings” posts. 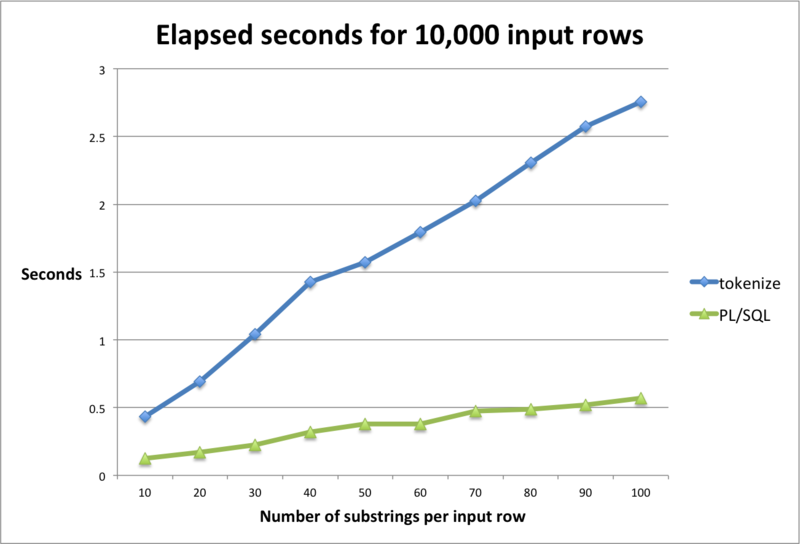 The big news is: PL/SQL beats SQL! XQUERY provides some builtin functions prefixed by “fn”. fn:tokenize is equivalent to ora:tokenize except that it doesn’t break when the delimiter is absent from the input string: it just returns the string. Marc says fn:tokenize is supported, and it does work in 12.1.0.2, but the official documentation says “not supported”. I have asked Marc for more information. This is not a big deal. With fn:tokenize, there would simply be a bit less typing. Todd pointed out that tokenize splits a string based on a regular expression, and some common delimiters (like ‘|’) have special meaning in regular expressions. As a result, I now recommend to simply escape the delimiter with a backslash ‘\’. Todd provided a string splitting function in PL/SQL and claimed it is clearly faster than ora:tokenize. He is right! Notice that I keep the same number of input rows here, whereas in my previous tests I kept the same number of output rows. My “tokenize” solution scales OK, but the PL/SQL function is much faster and scales even better. In this case a combined SQL + PL/SQL solution beats the best pure SQL solution. Great post, thanks for this in-depth analysis, Stew. In terms of UDF not making much of a difference, you are only calling it once – for every iteration in the test – within the TABLE operator. So I wouldn’t expect you see much of a difference, compared, say, to involving a PL/SQL function the WHERE clause and having it executed thousands of times or more. Obviously, the regexp stuff used behind the scenes by ora:tokenize does a lot more work than just looking for a simple delimiter. It’s still relatively fast compared to other approaches because, internally, the CBO rewrites ora:tokenize to the built-in kernel function SYS_XQTOKENIZE, as part of an optimization process called “XQuery Rewrite”. Sometimes, this rewrite is good, sometimes not. It can be disabled via the NO_XML_QUERY_REWRITE hint. I’ve run your test case with this additional hint, and that makes tokenize a little faster (at the expense of more PGA used), but still 3x slower than PL/SQL though. And it should be straightforward to extend the PL/SQL code so that it can handle CSV quote delimited fields, too.